Love the contrast with the color of the top! Fabulous !! Yellow looks amazing on you ! Hello,Ciao...Amazin photos and Style...your Outfit is Outstanding,Fabolous...the yellow colour is great on you! Your beauty is as shining as the summer Sun! Love this, your top is so cute, love how you matched the belt perfectly. amazing colour of your top! Great photos and wonderful this bag with studs! NEW POST, I hope you come to visit ... I expect a comment! I follow you on Instagram, I'd be really happy if you also follow me on instagram! KISSES AND GOOD DAY BEAUTY! M.
The yellow top looks great on you. Looking fab as always. stunning look dear! love the shoes! LOve the yellow top! what Camera do you use? Me encanta este look, el top precioso!! Perfect this combination of yellow and black, bag is very cute! oh wow that top makes everything complete! Beautiful again dear! Hope you had an amazinggg time in Dubai! Great look, love the top!!! Lucky you! I would like to visit Dubai one day. This outfit is very nice. I like this combo. And your outfit is so chic and fresh! Gorgeous outfit, I love everything about it! And I can´t wait to see the pics from Dubai!! Amei o look, o amarelo ficou muito bem em você! 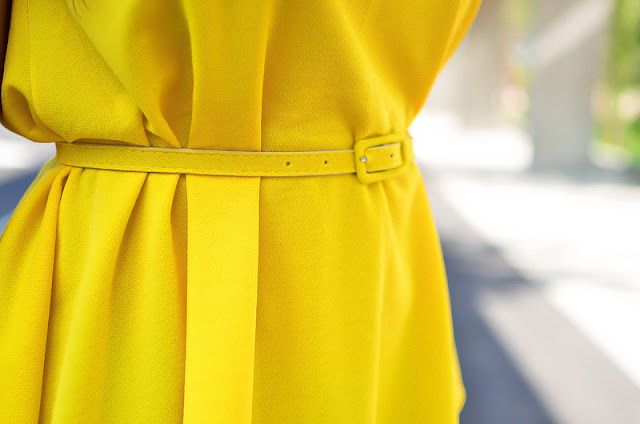 I love the yellow, it´s the color of the summer! I have the same Zara shoes! Love them! You rock that outfit!